In deep fryer or 3-quart heavy saucepan, heat oil over medium heat to 350°F. Meanwhile, in medium bowl, beat whipping cream, apple cider, pudding mix and apple pie spice with electric mixer on medium speed until thick. Cover; refrigerate. Separate crescent dough into 4 rectangles. Firmly press perforations to seal. Stack 2 rectangles on top of one another. Fold in half widthwise to make tall stack. Repeat with remaining 2 rectangles. Use 1-inch round cutter to cut 14 holes from crescent dough stacks, rolling and rerolling dough as necessary. Place paper towels under cooling rack. Gently drop 4 or 5 balls at a time into hot oil. Cook 2 to 3 minutes or until golden brown. Remove to cooling rack to drain; cool 30 seconds. 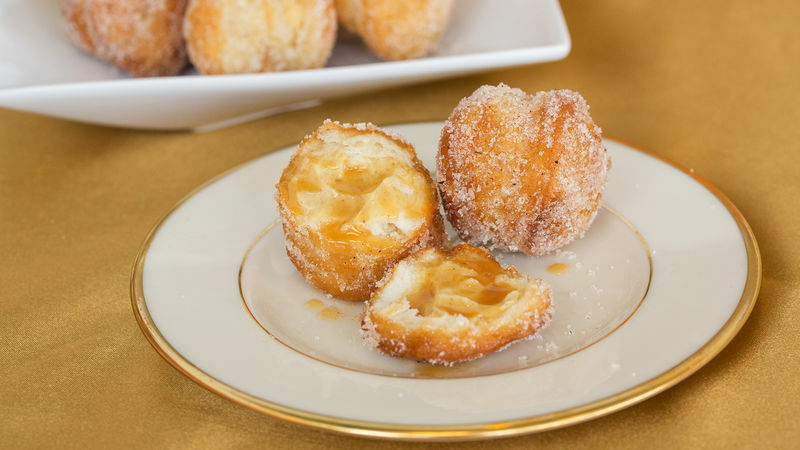 Toss doughnut holes in cinnamon sugar. To fill doughnut holes, spoon pudding mixture into decorating bag fitted with 1/2-inch wide tip. Insert tip in side of each ball; squeeze about 1 tablespoon pudding mixture into centre.